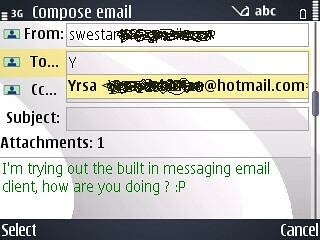 Admin Note: Please welcome swestar, the newest addition to the E71 Fanatics Team. Follow him on Twitter. 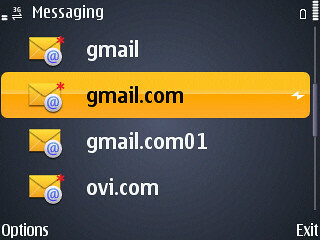 On standby screen the built in messaging client shows an email inbox icon (highlighted in yellow) and clicking on it takes you to the accounts and folders for the email accounts you've setup. 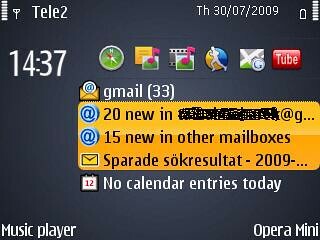 As you can see the highlighted account in yellow with a small icon on the right means I'm retrieving new emails and that my account is online. 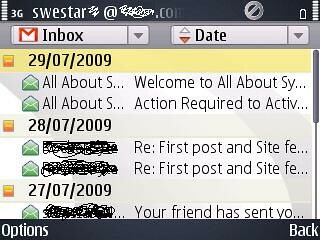 Some screenshots of the actual inbox showing a header, date and first row of the highlighted email and you can attach photos, videos, and other files while composing a new email. 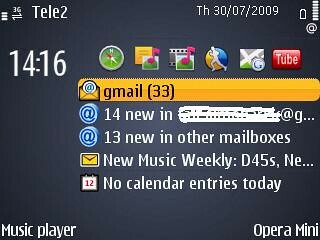 Unlike Nokia Messaging's auto-find contacts by letters, I have to digg in contacts to get to the person I want to email. The whole format reminds me alot of simple sms texting. 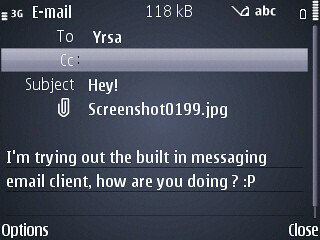 Nokia Messaging on standby reveals a bit more information about your latest emails in your different accounts. The UI is very fluid with some nice settle transitions when navigating between icons. 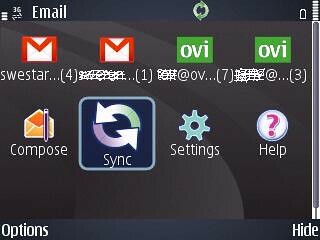 Every account gets a nice big icon showing the Gmail, Ovi and MSN logo etc. The little green circle on top shows the activity of syncing my inboxes. 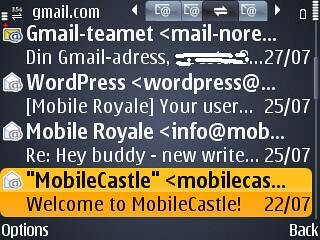 The Nokia Messaging can view full HTML emails and has the neat auto-find contacts search which saves a few seconds of digging in contacts. The green text is an indication of copied and pasted text separating it from the rest. The Nokia Messaging client is lately being shipped on the latest E-series and N-series devices wish is a big step forward compared to the built in messaging client. Here's the link to the Nokia Messaging website with full instructions on how to get the application working on your device. If you have any trouble installing or setting up your account, leave a comment below and I'd be happy to answer them the best I can!